Paper Pawz: Simon Says: Baby It's Cold Outside! Simon Says: Baby It's Cold Outside! It's Wednesday crafty friends and that means it's time for a new Simon Says Stamp Wednesday Challenge! This week Simon Says: Baby it's Cold Outside! 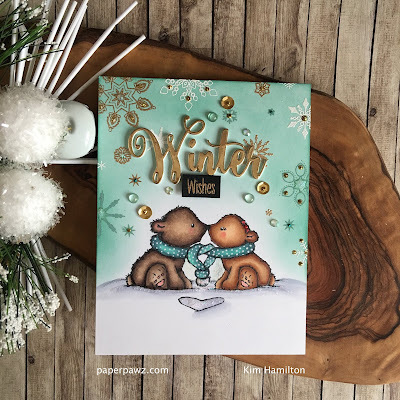 The design team is featuring fantastic Penny Black products, it isn't a requirement to use them but if you have them we would love to see them! Come join in on the fun, you have the chance of winning a $50 gift card to the fantastic Simon Says Stamp store! I had to use this sweet set by Penny Black called Nose to Nose, these bears are adorable! I started by stamping my bears with Lawn Fawn Jet Black Ink on a Neena Solar White 80lbs card panel (4.25 x 5.5). I then colored the images with my Copic markers (all colors listed and linked below). I colored the scarf last and I decided to use some BG75 and BG72 - colors I don't usually play with often and I am so happy with the result. Using those colors for the scarf made me rediscover the gorgeous Evergreen Bough color in the Distress Ink and Oxide lines. I LOVE this color! So I chose that one to blend my sky. 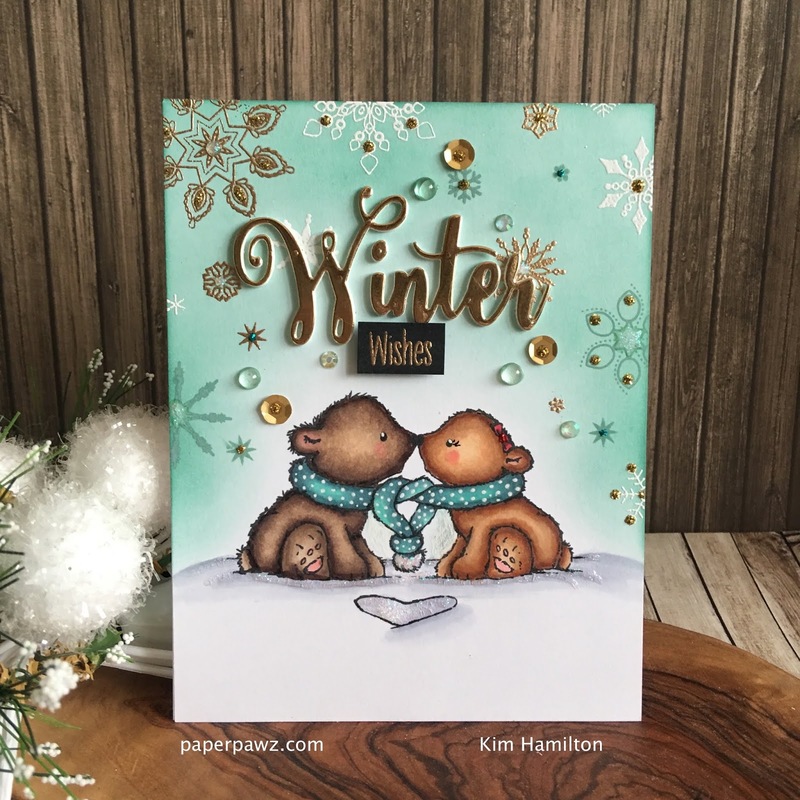 Once that was complete and dry, I stamped snowflakes from a couple of different sets (linked below) and I alternated between gold and white embossing and the Evergreen Bough Oxide Ink. I was so happy with the way it turned out. 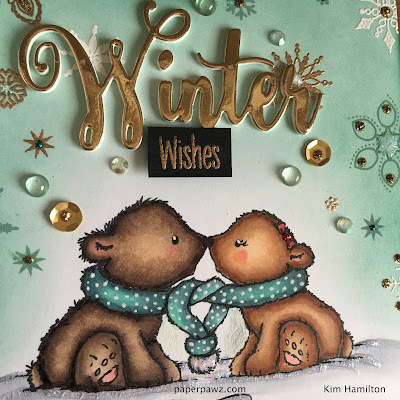 I then die cut a Simon Says Stamp brand exclusive winter die from a Tonic Harvest Gold Mirror cardstock and a fun foam and StickIt sandwich and I placed it on my panel and added to secondary sentiment on Lawn Fawn Black Licorice cardstock. For embellishments, I added this great Coconut Palms mix (also listed below) with a mix of gold Stickles, Nuvo White Blizzard, Nuvo Simply White and Nuvo Sunlit meadow. I finished with a little white gel pen detail! Products used are listed and linked below, affiliate links used at no extra cost to you! WOW !!! I have no word...so much beauty and cuteness in this absolutely gorgeous card. I love it ! Fla la la la la la la mingo! Christmas Tags featuring Sunny Studio products!